He is the unchallenged King in the jungle. Even the Aussie media have showered praise on him ahead of the series Down Under. His recent exploits in Test and ODI cricket have been well documented. But what about Kohli – the T20 batsman? Kohli isn't perhaps given the credit he deserves in the shortest format of the game. From a chubby youth who could slash hard and play conventional cricketing shots with conviction, he has grown into a T20 player who has all the shots in the book – conventional and unconventional. The transition perhaps came at Royal Challengers Bangalore where he had the mesmerizing AB de Villiers to watch and learn from. 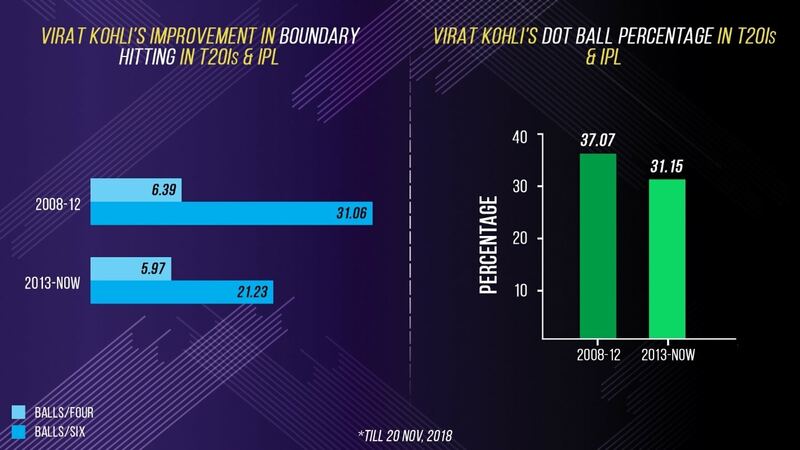 A glance at the initial half of Kohli's T20 career gives you a glimpse into the kind of player he was – an anchor in the middle-order without the big-hitting skills. But that average, which lurked below 30 before 2013, zoomed up to nearly 50 in the next half with Kohli giving his T20 game a tweak to adapt to modern standards. He was the highest scorer in the 2014 World T20 in Bangladesh with 319 runs at a staggering average of 106.33 and strike rate of 129.14. He developed this ability to raise his game on the big stage and was again in stupendous form in the next edition in India in 2016 where he aggregated 273 runs in just 5 innings (second-highest) at an average of 136.5 and strike rate of 146.77. They say, if you are a technically good batsman, you can ace any format. The Indian skipper is a living example. Kohli took his T20 game to another level with a phenomenal increase in strike rate – his hitting prowess was now as good as any other batsman’s in world cricket. In the 2016 IPL, Kohli slammed a record 973 runs in one season at an unbelievable average of 81.08 and a mind-boggling strike rate of 152.03 – no one has ever scored more runs in any single IPL season. What notably changed then was the manner in which Kohli turned into a six-hitting monster, a facet of his game that was nearly absent in the first few years. Kohli hit 38 sixes in the season – no one hit more. It also gave him the self-belief that he could get the maximum at will. He started hitting boundaries more frequently while keeping his dot ball percentage a minimum, a deadly combination that resulted in his strike rate soaring. Till 2013, Kohli had a strike rate of 121.92 in T20Is and IPL matches. That was combined with a balls/boundary of 6.39 with a six coming roughly every 31st ball. Those numbers have been transformed completely, with him scoring a six roughly every 21st ball since 2013. Combined with a dot ball percentage of 31.15% - down from 37.07% before 2013 - his strike rate rose to 137.67. He is no longer reliant on just fours and quick doubles to increase his strike rate. The three T20Is against Australia will challenge Kohli. The bigger grounds could test his six-hitting abilities, but it isn't beyond him to develop his game to the growing requirements. He has already shown that with his unabated growth.